Wellll I planned on recapping our December Asheville trip for this Travel Tuesday, but with all the moving, I am not even close to going through all of the pictures on my camera. So that will have to wait for another day. Try to contain yourselves. If you missed it, we are in the process of moving from Wilmington to Greenville, so I thought it might be a good time to list some of our favorite Wilmington spots before they are all a beloved distant memory and I have no recollection of the beautiful beach dream that I’ve been living (not dramatic at all). This past weekend was likely my last weekend in Wilmington for the forseeable future, so we spent some time hitting up my favorite spots. Aka, the best part of the area. 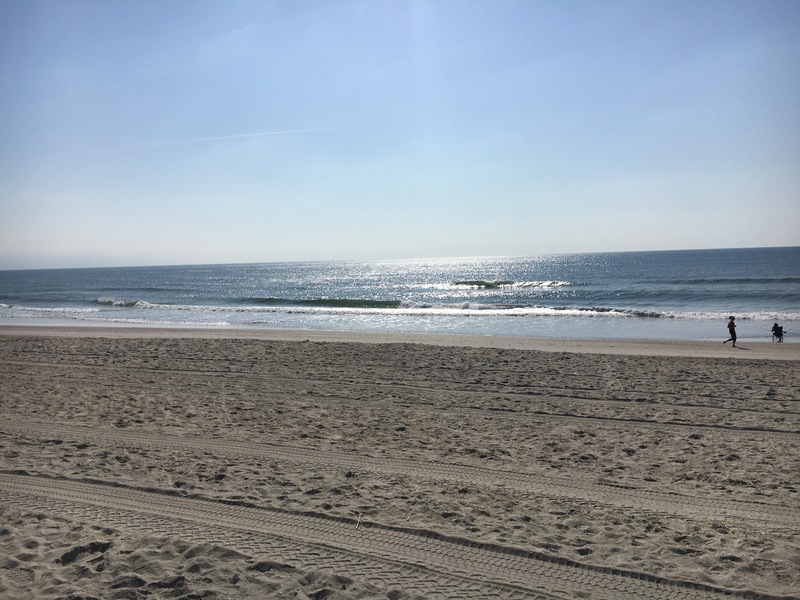 There are three main beaches in the Wilmington area, and even more if you look across the river in Brunswick County or north at Topsail. For the sake of this post, I’ll focus on the three around Wilmington. Wrightsville Beach is probably the most popular beach near Wilmington. It’s easily accessible from downtown (a straight shot on 74), has a ton of restaurants, is home to “The Loop” (a popular running route), has more beach houses than hotels (which helps keep the beach less crowded), and is generally a “nicer” beach. You will also see more boats and activities like kayaking and stand up paddleboarding, thanks to the lovely Intracoastal Waterway. 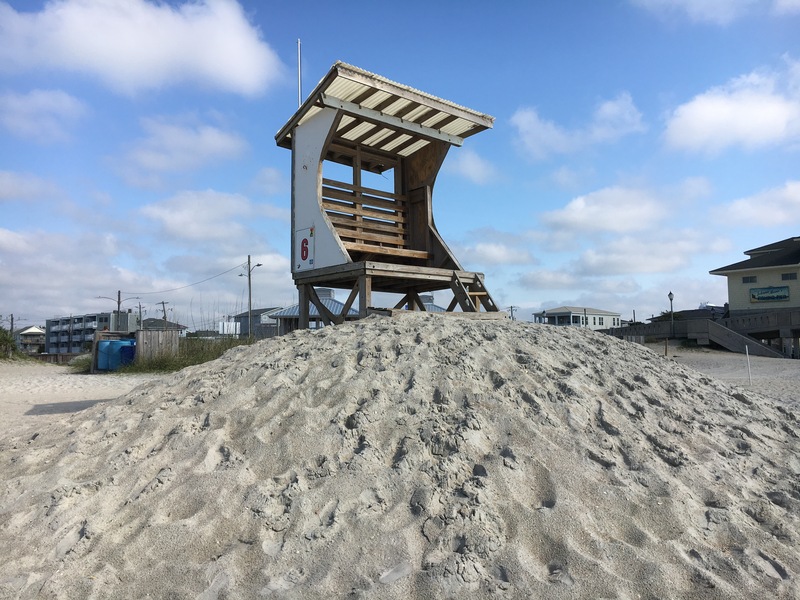 If you are looking to really explore Wilmington and/or are an active vacationer, Wrightsville is your jam. 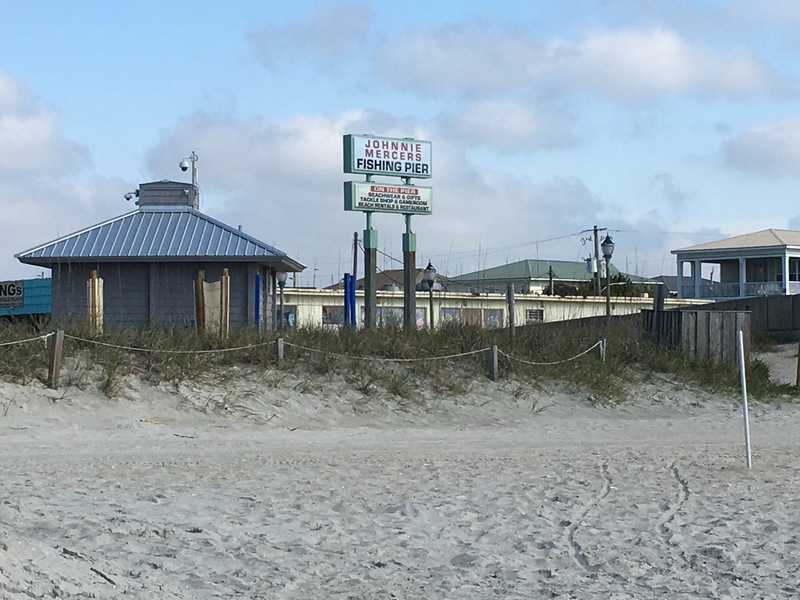 Carolina Beach is a little further away from Wilmington proper and is more….touristy? than Wrightsville. There are more souvenir shops, kitschy beach themed restaurants/buffets and bars, more high rise hotels, etc etc. This reminds me of the beaches that I would vacation at as a kid. There is a boardwalk with an arcade and a small amusement park. Definitely a family vacation vibe. If you have kiddos on board, Carolina is a winner. Kure Beach is just past Carolina Beach and is the quietest of all three. It has less restaurants (but still enough to get you by) and shops than either Wrightsville or Carolina. There is also free parking so Nick and I hit this beach a lot (is there any harder pill to swallow than having to pay for parking at the beach where you live? In Virginia Beach there are some lots where you can park for free as a resident, get with it Wrightsville.). If you plan to be a total beach bum and want quiet and serenity, Kure is the beach for you. Oh, the food. The glorious, glorious food. This is definitely one of the things I will miss MOST about Wilmington. For the first six months we lived here, we talked nonstop about how much we loved the weather and the food. We couldn’t shut up about it. We annoyed and alienated all of our friends. But it’s ok, because we filled that void with MORE FOOD. Fish Bites – This isn’t a surprise to anyone that knows us. This is stop 1 on our Wilmington tour when people visit us. Fish Bites is very unassuming, it’s in a shopping center in the middle of Wilmington, far from downtown or any of the beaches. But it’s our number 1 recommendation if you are looking for simple seafood. We had family members want to go here 3 times in one long weekend visit, it’s that good. Their fresh catch is my default choice, and I highly recommend the coconut sauce with that (unless it’s tuna). They also serve raw oysters during oyster season that are delicious if that’s yo thing. The mussels appetizer, the crab dip, the zucchini fries, all amazing. I could go on and on about this place, but I’ll spare you. Just be sure to go. We tell everyone we know about it and have never gotten anything less than glowing reviews in return. Catch – Catch is located on Market St., also in a shopping center and not near downtown or the beaches (I guess I have a type?). The chef was featured on Top Chef Texas and is a bit of a local celebrity. 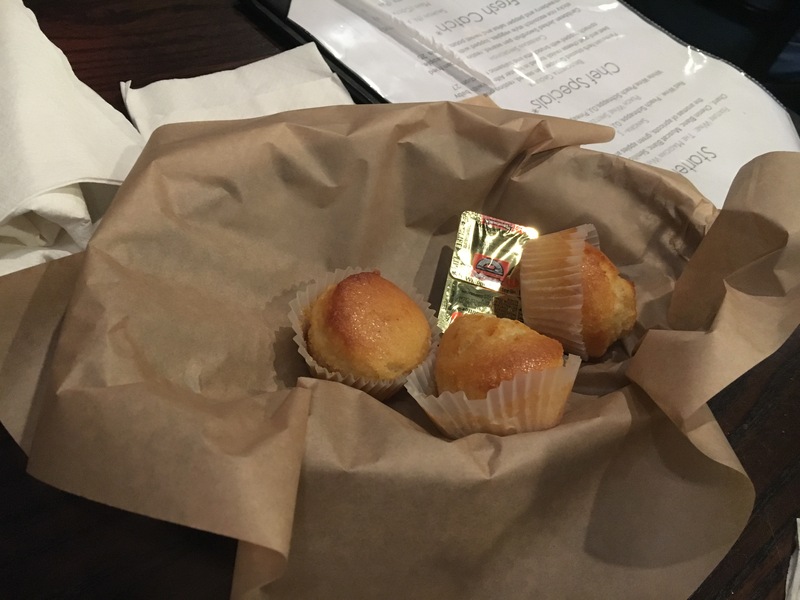 It’s a bit more expensive than Fish Bites (~$30 per entree) but the food is a little more high end/modern/creative as well. Their menu changes frequently, so my recommendations are probably useless, but their asian-ish entrees are always amazing. Las Olas – Mexican food is my favorite food. Period, the end. And for me, Mexican food really comes down to the salsa, and the salsa here is FANTASTIC. It’s super fresh and super cilantro-y. Their seafood tacos are amazing, and you have to get the Street Corn as a side. Nick and I used to live across the street from this place when we first moved to Wilmington, and I could have eaten here weekly. Or daily. The owners of this restaurant own a couple other in the area, I’ve tried k38, but not Tower (which is located in Wrightsville), and it was just as good. 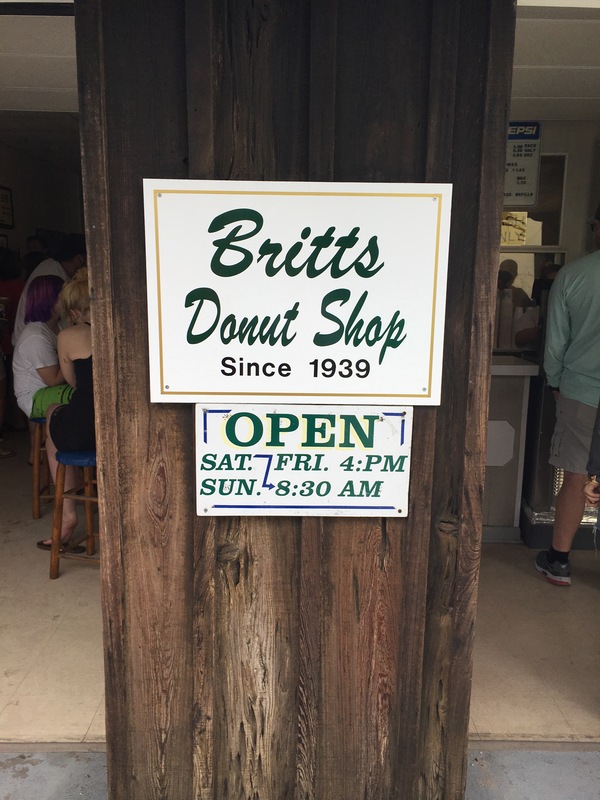 Britt’s Donuts – I will preface this recommendation by saying I don’t even like donuts. Whaaat? I know. But here I am, recommending a donut joint. We heard about Britt’s from our apartment maintenance manager when we first moved here, and after the conversation I promptly forgot all about it, because I am anti-donut. We were checking out Carolina Beach a week or so later and walked right by it and I was all “oh yeah, that’s that donut place that guy was telling us about.” We were between meals and decided just to have one each to see what the BFD was. OMG IT WAS HEAVEN. 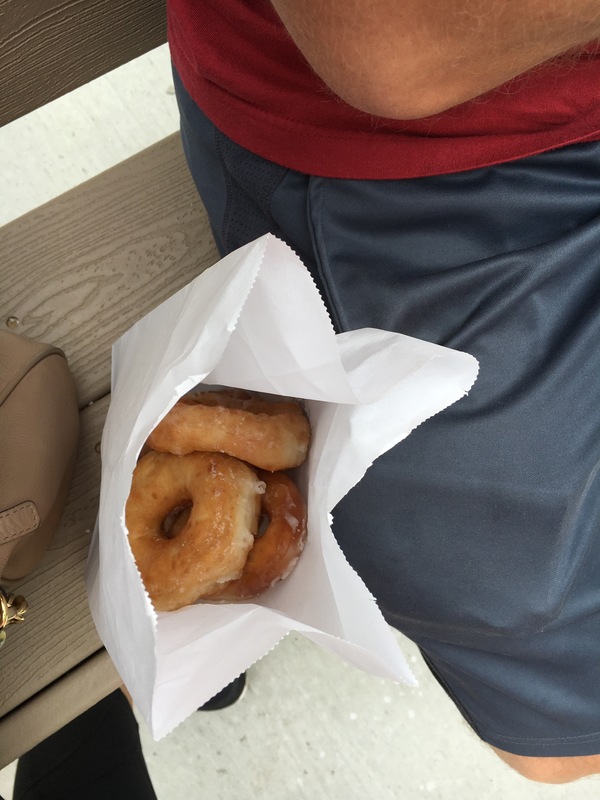 These are the lightest, sweetest, fluffiest donuts you will ever have in your entire life. They only make one kind, but it’s the only kind you will ever need. They created the absolute perfect donut and it would be an insult to you to serve you anything else. There is usually a line all down the boardwalk during the summer, but it’s worth it. I recommend getting at least half a dozen per person. My brother-in-law holds the current record of eating an ENTIRE dozen in one day. 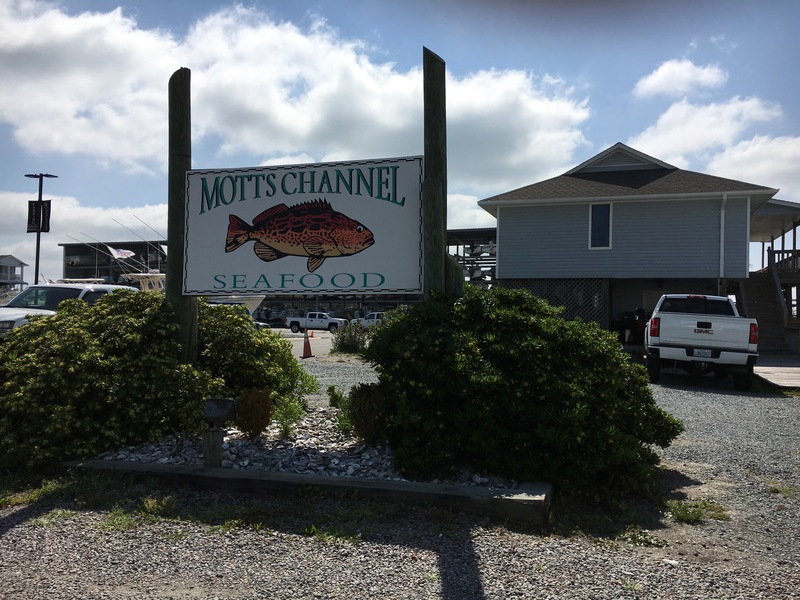 Mott’s Seafood Channel – I know, this isn’t even a restaurant, but it is hands down the best fish market in Wilmington. If you are visiting and have access to a kitchen, do yourself the kindest favor you possibly can and make dinner in one night. And buy that dinner at Mott’s Seafood. It’s located near Wrightsville Beach, and after trying a ton of different fish markets in the area, it’s the only one we go to now. Their seafood is always SO fresh, and we have fun trying all kind of different things according to what’s in season. The employees are especially helpful and we always ask what is the freshest/what looks good. If you happen to be visiting between October and May GET THE STUMP OYSTERS if they have them. SO, those are my “must-do” places in the Wilmington area, and now I’ve successfully bummed myself out about not being able to visit them again. I’m going to go be sad about not living at the beach anymore, K bye. This post is part of the Travel Tuesday linkup! I LOVED this post! we were in NC this past December but stayed in the Charlotte area, I definitely need to venture out more, will save this for future reference! I’m off to find your Charlotte post, we have family in the area and will likely be visiting a lot! Ooh you should definitely try to visit for Memorial Day! I would selfishly love to read a post about it 😁. It’s only about a 4 hour trip from Richmond! the Carolinas are some place I’m dying to spend more time! they seem to have so much charm and character to them. They do! I didn’t talk much about the downtown area but it is on the river and is super charming. I love looking at the historic old homes. Those beaches look incredible! And as for the food… wow. Everyone is posting about doughnuts this week and I don’t know what to do with myself because I’m an absolute doughnut fiend! I’m going to have to hunt down some good gluten free ones. It needs to happen. OK, i stumbled in here from the internet when searching about Wilmington, tried Fish Bites yesterday, very good. Was it better than Christfields in Wash. DC on GA Ave which i say is the best seafood rest. in the USA? noooooooooooo, but Fish Bites gave it a run for it’s money. I got the stuffed flounder, very fresh and very well prepared, on to the doughnut place today if they are open! I’m so glad you enjoyed it! I will have to add Christfields to my list next time I visit DC. DRAT! Brits donuts was closed for the season, i think they open in March. To bad, as i have a HORRIBLE weakness for donuts, a Homer Simpson type weakness and i was wondering how they would stack up against the BIG BOYS, aka Krispy Kreme. 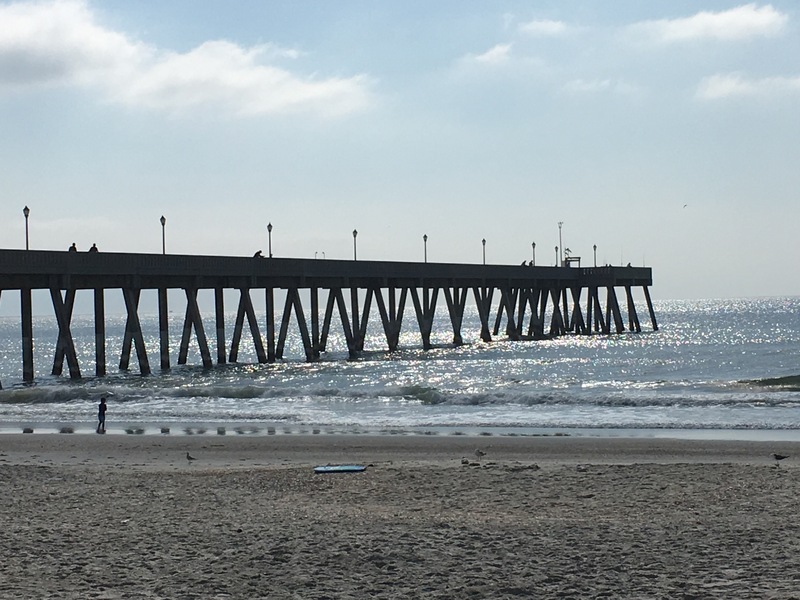 Continued on to Kure beach and Fort Fisher, i like Kure best, great fishing pier and much more low key than carolina or wrightsville beach. Very deserted and easy to get around down here on Feb 1 but, it was 75 degrees and sunny, glorious weather to walk the beach. Bummer!! I think they are good enough for a repeat visit if you are close enough :). I think they edge out Krispy Kreme. Pretty similar in taste but just have a muc lighter/fluffier texture which I LOVE. I agree, Kure is the most laidback and where I would want to vacation if I was looking to unwind and decompress. So glad you got some good weather!